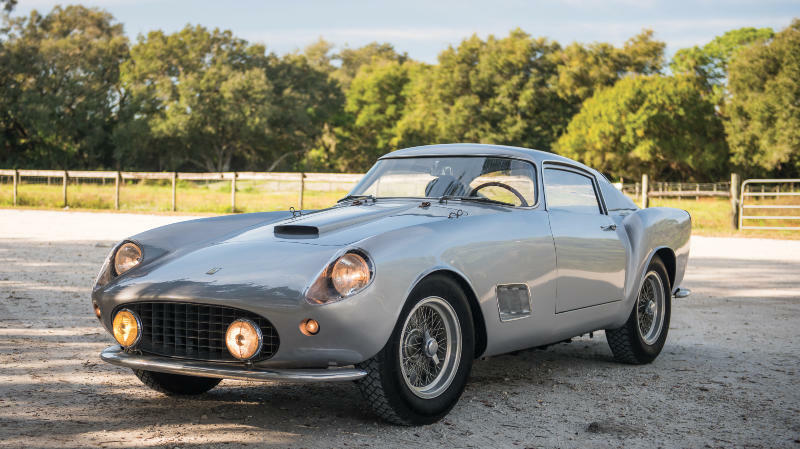 A 1957 Ferrari 250 GT Berlinetta ‘Tour de France’ and a 1939 Mercedes Benz 540 K Cabriolet A are the top cars at the RM Sotheby’s 2016 Amelia Island sale. Five Ferraris and three Mercedes Benz cars are expected to sell for over a million dollar but cars as diverse as a 1911 Rolls Royce and a 2014 Pagani Huayra are expected to sell for multiple million dollars. RM Sotheby’s Amelia Island classic car auction will be held on March 12, 2016 at the Ritz Carlton Hotel during the Amelia Island Concours d’Elegance. Nearly 100 cars will be on offer. In 2015, RM Sotheby’s earned $60 million at Amelia Island but more impressive was the 100% sell-through rate. RM Auctions set the Amelia Island auction week record in 2014 at $6.6 million for an elegant 1937 Delahaye 135 Competition Court Torpedo Roadster. This record is under serious threat this year, not only from the 1957 Ferrari 250 GT Berlinetta ‘Tour de France’ but especially from a 1937 Bugatti Type 57 SC Sports Tourer (estimate $ 11 – 13 million) at Bonhams and a 1961 Ferrari 250 GT SWB California Spider (estimate $15,000,000 – $17,000,000) at Gooding. A 1957 Ferrari 250 GT Berlinetta ‘Tour de France’, chassis 0619GT, estimate “Upon Request”, is the headline car for the RM Sotheby’s 2016 Amelia Island classic car sale. This 1957 Ferrari 250 GT Berlinetta ‘Tour de France’ was originally chassis 0805GT but in a special arrangement (to avoid taxation) the chassis was renumbered 0619GT, a number already used by its first owner Pierre Noblet, a French industrialist. He raced the car at least ten times from 1958 to 1960 and although victory escaped him, finished on the podium several times. In addition to regional races, he also finished a fine 4th in class at the Grand Prix de Spa (1958) and 3rd overall at the 12 Heures de Reims (1958). For the past four decades, the 1957 Ferrari 250 GT Berlinetta ‘Tour de France’ belonged to Wayne Sparling, a former Luigi Chinetti Senior NART Technician, who restored the car just over a decade ago. The car has its original matching-numbers engine and is in the original color scheme. The car on offer is the only known Spezial Cabriolet A in existence. The main difference from the standard Cabriolet A is the raked vee’d windshield similar to the Spezial Roadster. Its earliest known post-War owner was the tenor James Melton followed by Otis Chandler, publisher of the Lost Angeles Times. He had the car restored and subsequently won Best of Show at Pebble Beach – in 1973. The car was again restored in the 1990s, when it received the present color scheme of bright scarlet over tan leather upholstery and tan cloth top. The 1962 Ferrari 400 Superamerica LWB Coupe Aerodinamico (estimate $2.7 to $3.3 million) is one of only 18 built and was the Turin Automobile Show car. The original owner was Erwin Goldschmidt, who ordered several special options and kept the car until his death 17 years later. His son sold it out of the family only in 2003. The car was completely restored to concourse condition in 2012. It is a matching numbers example although the color was changed from red over black to dark blue over tan. RM Sotheby’s sold the Ferrari 400 Superamerica LWB Coupe Aerodinamico London and Chicago show car for $3,245,000 at Paris 2016. Several Rolls-Royce cars failed to sell at recent auctions but the 1911 Rolls-Royce 40/50 Silver Ghost Tourer by Lawton, estimate $2.5 to $3.5 million) is more special than most. Only around 20 of these cars retained their original body, chassis and engine with the open touring models particularly rare. The car has a well-documented history with the same owner for the last two decades. Ferrari built only 121 Daytona Spiders, of which this 1973 Ferrari 365 GTS/4 Daytona Spider, estimate $2.5 to $3 million, is one of only 18 in European specification. It was the 48th Daytona Spider built and is presented in its original livery of Giallo Fly yellow over black. Although with its original engine and in restored concourse condition, the car did suffer a number of accident, especially during the 1990s. The 1968 Ferrari 330 GTS by Pininfarina, chassis 10817, estimate $2.3 to $2.6 million, is one of only 99 produced compared to nearly 600 of the 330 GTC coupe. The car was completely restored in 2000 when the color scheme was changed from silver over red to pale yellow over tan. This car sold for $2.4 million at Gooding’s 2015 Scottsdale sale. The 1984 Ferrari 288 GTO, estimate $2.3 to $2.6 million, was the first of these models officially delivered to Japan, although it was the 137th of 272 examples built. The original owner was the renowned Ferrari collector Yoshino Matsuda. This car sold for $2,750,000 at RM Sotheby’s 2015 Arizona sale. Everything with Pagani tends to be a bit over the top. The 2014 Pagani Huayra, estimate $1.9 to $2.2 million is one of only 100 that will be built – all sold out – and originally came with a price tag of around a million dollar. This model had $260,000 worth of options fitted including a $20,000 seven-piece luggage set. The car has covered only 400 miles – presumably the luggage set can be labeled unused too. The 1955 Mercedes Benz 300 SL Gullwing, estimate $1.3 to $1.5 million, is a matching numbers, restored example with its original bodywork. The color was changed from black over grey to white over red. Bonhams will also offer a Gullwing at Amelia Island 2016. The 1957 Mercedes Benz 300 SL Roadster, estimate $1 to $1.3 million, is offered from single enthusiast ownership for the last 42 years. The car was restored in 2002 and since won best in class at both Amelia Island and Hilton Head. Even at softer prices at recent auctions, the estimate is on the low side if the car is in the good condition it claims to be. 1954 Bentley R-Type Continental Fastback Sports Saloon by H.J. Mulliner, estimate $1.2 to 1.4 million – the car had only four owners since new and won Best in Class at Amelia Island in 2010 after a complete restoration. 1932 Ford Model 18 Edsel Ford Speedster, estimate $1.2 to $1.4 million – the first of three one-off speedsters built for Edsel Ford. 1931 Bentley 8-Litre Tourer by Swallow, estimate $1 to $1.25 million – the 13th of only 100 8-litre Bentleys produced. 1968 Chevrolet Sunoco Camaro Trans Am, estimate $900,000 to $1.2 million – the third of six built and the first delivered to the Penske team where it was raced by amongst others Mark Donahue and Sam Posey. It never won in America but scored several victories at races in Europe. 1931 Stutz DV-32 Convertible Victoria by Rollston, estimate $800,000 to $1 million – the first of five built to this design. The restored car won Best in Class at Amelia Island in 2013.